The warm air waving perfumed breezes of wild thyme, sage, rosemary, lavender, and fennel. Our senses titillated by the aromas and warmth of Provence in the summer. I’m so in love with every one of these flavors, aren’t you? Stop to smell the Lavender! 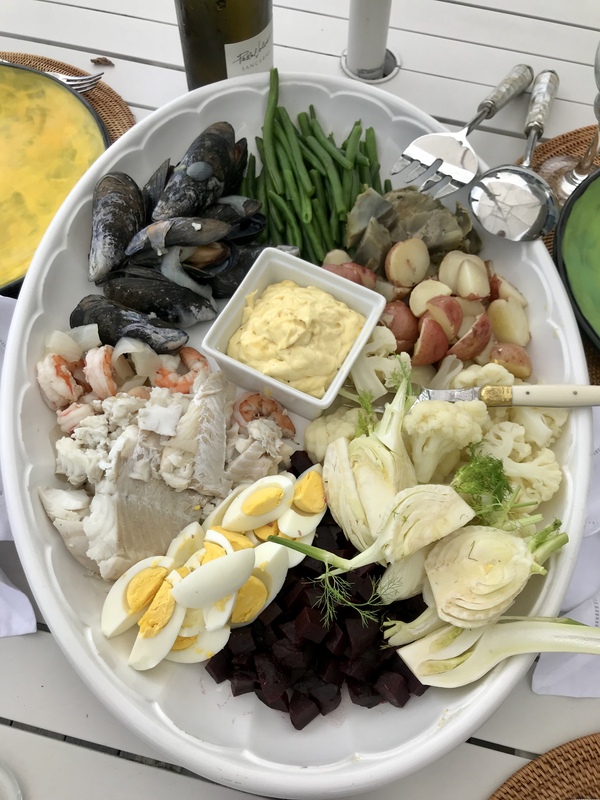 One of the famed traditions of the region is to serve Le Grand Aioli at a summertime party of friends and family. For me, this dish brings up such a profound memory of a dear foodie friend, Sheila Lukins of The Silver Palate. The twist, however, is that it’s not from a glorious meal in a hidden spot found while traveling in the south of France! The best Grand Aioli I’ve EVER had was from right here, on the East Coast, in the shadow of France’s greatest gift to us (besides Provencal flavors), the Statue of Liberty! It was the summer of 2008 when Sheila invited me to her home for a dinner party, in the village of Sag Harbor. 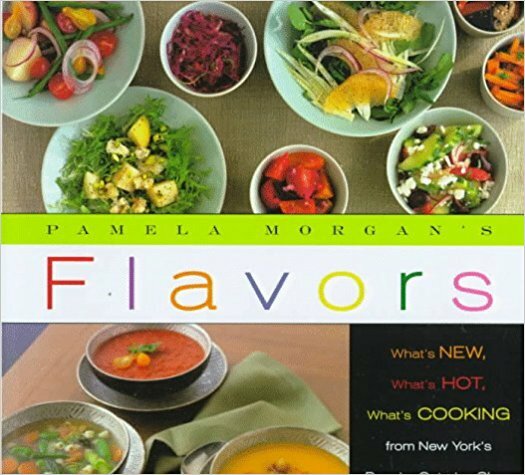 I became good friends with Sheila after working closely with her at her well-known food shop, The Silver Palate in Manhattan. It was one of those sultry and miserable August evenings in New York, when even on Long Island the fresh air doesn’t feel so fresh. And to our discomfort, Sheila’s home was “au naturel” and void of any air conditioning! Always a culinary wizard, though, Sheila knew just what to serve this group of 12 or so people on this rather steamy night. 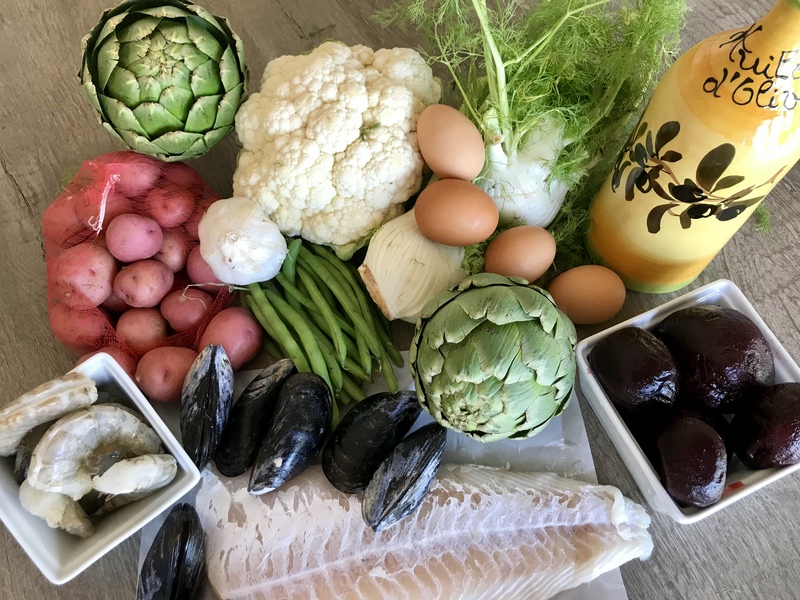 She served up a beautiful Grand Aioli platter full of fresh, seasonal vegetables and some of the finest cooked and chilled seafood. Sweet and succulent lobster and overflowing shellfish were the perfect accompaniments for such an affair. Voila! We filled our bellies on aioli, fish, and wine. When she offered dessert we passed because we were already laden from the seductive meal and just wanted to head back to our air-conditioned chariots to carry us home and to bed as quickly as possible! A year later, I lost my good friend, Sheila to cancer at the very young age of 66. So, when I make this dish, it is in her honor. There are so many ways to make this because the accompaniments are really whatever you want them to be. It’s a great dish for entertaining as it pleases just about anyone. In addition to your seasonal vegetables, and seafood, you can add some fragrant ham or perhaps some thinly sliced seared beef. The Perfect Dish to Highlight the Farmer’s Bounty! It’s a beautiful presentation and if you cook all of the elements in the same liquids as I do in my recipe the flavors sing together in harmony. The poached fish is fragrant and moist. I find the artichokes add something special, but they take a while to cook and pull apart. So, like the rest of the vegetables, you may want to make them in advance. I wouldn’t recommend swapping them for canned artichokes because it’s not the same. 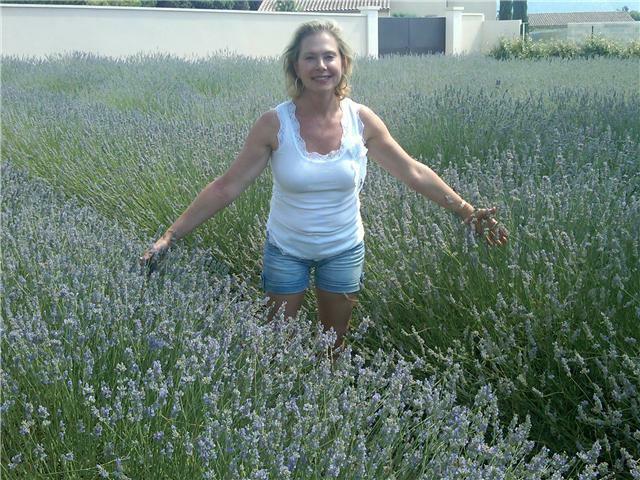 Here’s to Sheila and steamy Provencal summers wherever you are! This recipe is the perfect summer dish! It's served room temperature and can use any combination of seasonal produce and protein you and your guests would like. It's a great party dish as much of it can be made ahead and it will make mast everyone happy! In a food processor, pulse your garlic to a puree then add egg yolks and pulse until combined, add mustard and pulse, then lemon juice, salt and pepper. With the processor running, slowly pour in the canola or grapeseed oil through the feed tube and then finish with the olive oil. Taste and add more seasoning or lemon juice if needed. Refrigerate up to two days. Serve when ready. Trim 1/2 inch off the stem and top ends of the artichokes. Pull off the toughest outer leaves. With kitchen scissors cut off the prickly points of the remaining leaves. In a large nonreactive pot, combine the artichokes, wine, onion, lemon slices, oil, garlic, peppercorns, Pernod, bay leaves and salt. Bring to a boil, then lower the heat slightly and simmer briskly until the artichokes, when tested with the tip of a paring knife from the stem end, are tender, about 50 minutes. Remove from the water and set aside to cool. Reduce liquid to simmer. Meanwhile, in another large pot, bring water to boil for your potatoes. Season with salt. Add the potatoes and cook until fork tender, about 12-15 minutes. Remove from the water with a slotted spoon and set aside to cool. Reduce water to simmer. In simmering potato water, add the cauliflower, and cook about 5 minutes, until tender. Remove from the water and set aside to cool. Add the green beans to the same water, and cook about 5 minutes, until tender. Drain and set aside to cool. Once the vegetables are cool, slice the potatoes in half. Cut the cauliflower into bite-size florets. Cut the eggs into quarters. Remove the artichoke leaves (I like to save them to eat with any extra aioli the next day), discard the center choke (prickly bits), quarter and serve the hearts. In the simmering artichoke liquid, add the mussels, cover the pot with lid, and steam 2 minutes. Check the mussels, and remove any that have opened to set aside. Continue cooking, removing mussels as they opens so as not to overcook. Discard any that do not open after 10 minutes. Let mussels cool. Add cod to the same liquid, and cover with lid. Gently poach until just cooked through, about 7 minutes. Remove the cod and set aside to cool. Return liquid to a boil, add shrimp, and cook just until pink, about 3 minutes. Drain and submerge in ice water for about 3 minutes. Remove and pat dry with paper towels. In a small serving bowl, add your aioli and center on a large serving platter. Arrange the vegetables and seafood around the aioli in loose, but neat bundles. Serve with lots of lemon wedges.